Here is a quick reference of all known businesses and services in Roswell, and a Community Calendar. For full info on a specific business or location see the Places Guide. aliens supposed crashed in the desert in 1947. Roswell is in Chavez county. 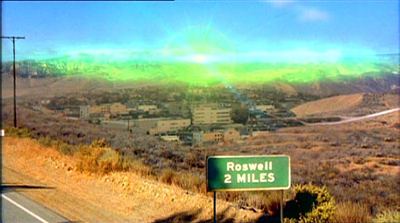 Roswell has a City Council who has power over the Sheriff. Enigma New Year's Party - Dec 31st - it has been going on since Jeff Parker was a kid - it is in a different location every year. You have to find clues and figure them out to get to the party. - in 2001 Enigma was held in Blue Moon Canyon. Junior High/Middle School - possibly there is more than one that the kids attended. It is only vaguely mentioned that Liz and Maria were in 8th grade together. Vic's Shoe Service - shoe repair?